The acrylic finish system with sand and cement base is fundamentally similar to the traditional stucco system. A sand and portland cement base coat with lime and water is applied over a building that has been properly sealed with weather barrier and wrapped in structural lath or wire. A second layer of sand and cement is then applied. This layer is levelled with a tool called a Darby and further to this is then ‘floated’ with a sponge. This step smoothes and levels hills and voids in the wall. This is a critical step because the acrylic finish is typically not textured and as a result will show any imperfections in the wall. Why You Should Use Stucco For Your Home? Attractive – Stucco is usually used for the exterior part of the house but some homeowners apply stucco on the interiors of their home and design it to any pattern they like. You can also employ an artisan to create great stonework and designs for you. The rustic look of stucco homes makes it more attractive especially with Tuscan or Spanish styles. Many rich homes are now constructed using stucco because it is makes the exterior wall look beautiful. If you want to design your interior using stucco you can use pigments to bring color to the stucco. Low Cost and Maintenance – Stucco is comparatively inexpensive compared to other building materials. Moreover, it is even more durable than other more expensive materials. It also needs low maintenance unlike buildings applied with paint. After a couple of years, paint is removed from the wall so you need to regularly maintain and re-apply paint. But with stucco, you do not need to regularly maintain or fix it. As long as the stucco is applied correctly, then it will last for many, many years. If you decide to add pigment to stucco, you should make sure the stucco is totally dry so that it will remain strong even after applying color. Durable – The most wonderful feature of stucco is its strength. If properly applied, stucco can last for even up to a hundred years. If you are uncertain on how it is applied, then consult a professional to do the job. 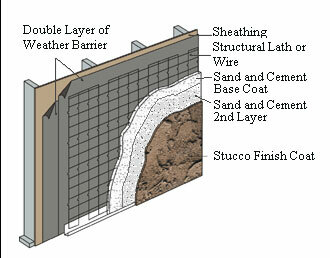 Great Weather Repellent – Stucco can resist bad weather conditions and can protect your home from both wind and rain. Stucco is also fire-resistant thus it can protect your home from damage. You will certainly enjoy the benefits stucco can provide you and your home as long as you apply it correctly. Use stucco today and learn how functional it can be.